Rookie Genrenaut Leah Tang gets her first taste of space flight when the team scrambles to fix a story breach in Science Fiction World, the domain of starships, weird aliens, and galactic intrigue. On the space station Ahura-3, Ambassador Kaylin Reed is on the verge of securing a peace treaty to guarantee the end of hostilities between some of the galaxy's most ferocious races. When Ambassador Reed is kidnapped the morning before the signing, it throws the station into chaos. The second episode of Genrenauts, a science fiction series in novellas. 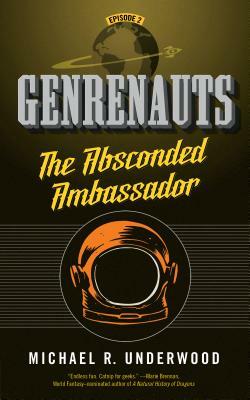 If you like Leverage, Redshirts, or Quantum Leap, check out Genrenauts for a brand-new adventure. Michael R. Underwood has circumnavigated the globe, danced the tango with legends and knows why Thibault cancels out Capo Ferro. He also rolls a mean d20. His novels include Geekomancy, Celebromancy and Shield and Crocus. He lives in Baltimore with his wife and an ever-growing library, and when he's not writing/gaming/living the dream he's the North American Sales and Marketing Manager for Angry Robot Books. He's also part of the Hugo-nominated podcast, The Skiffy and Fanty Show. "A Tardis of a novella, The Shootout Solution is packed full of ideas... The possibilities are endless... Tor.com continues to blaze a bookish trail in terms of both originality and diversity. More like this, please." "Snappy dialogue, twisting plot turns, and efficiently written action scenes combine with a strongly realized protagonist that reminds me of a old friend from my art school days, not a cardboard cut-out of the “strong female character” trope." "The entire book is just FUN"
"The Shootout Solution is Genre blending fun." "We like nerdy Leah and were able to immediately identify with her. She should return for many more episodes!" "I can see this really appealing to readers who are into browsing TV Tropes, or who liked Ready Player One but want a more satisfying experience." "The concept of Genrenauts is awesome." "It’s told with a light touch — the debt to Leverage and The Librarians is obvious (and readily acknowledged), with a good dose of action, a hint of a looming catastrophe/conspiracy. There’s a good deal of literary/narrative theory under-girding this whole project — it’s not as frivolous as it may seem." "It’s got a clever, rather cool central idea. It has a plot built around that which keeps up suspense, whilst giving you a protagonist to care about, portrayed well, in a world which feels believable – perhaps by virtue of the setting for that world. I’d like to see more of all of the characters, and really, more of the setting in general, but that’s more recommendation than complaint!"